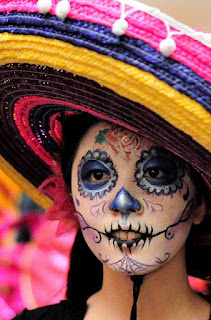 Dia de los Muertos (Day of the Dead) is a Mexican holiday which focuses on remembering and praying for friends and family members who have died. The celebration takes place November 1st and 2nd and coincides with the Catholic holiday of All Saints Day. In many areas of Mexico, November 1st is reserved for honoring children and infants while November 2nd remembers adults. If you live anywhere in the South United States, you have probably seen the decorated Sugar Skulls used as part of Dia de los Muertos. While decorating the skulls can be a fun program for teens this one is a twist on that tradition which transforms the teens themselves into the skulls. Use white eyeliner pencils to draw circles (eye sockets) around eyes and outline the heart-shaped space at the end of the nose that will be filled with color. Use white creme base to fill in face (except for eye and nose sockets). Lightly powder with white powder to set creme base. Using a sponge gently apply a vibrant or dark eyeshadow in the eye sockets making sure not to cross the line into the white part of the face. When finished with the base color use a small brush to create the "feathering" or "petal" effect around the eye socket. Select a color from the palette and fill in nose socket. Then, using a large makeup brush, gently brush blush onto apples of cheeks. Next take a fine brush and, using the black gel liner, extend the corners of your mouth along your cheek as though tracing a line where your teeth meet when your jaw is clenched. Use the same fine brush and gel liner create vertical slashes along the extended smile. Finally, use a small brush and black eyeshadow to trace out web designs or flourishes then trace over with fine brush and black gel liner. NOTE: These directions are just basic suggestions - you can be as creative as you want! You can also look up the artist Sylvia Ji for inspiration.